Zinc Oxide and Eugenol B.P. 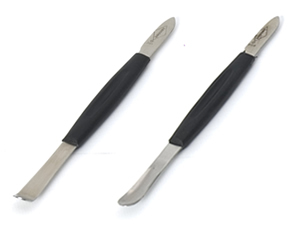 Kemdent stainless steel wax knives. Available with flat end (PJC201) and spoon end (PJC203). The blades are made of stainless steel whist the handles are black polypropylene for extra strength. The taper ground hardened and tempered blades allow flexibility for safe and comfortable use. Each knife and mixer can be sterilised by autoclave or gamma irradiation,. Copyright © 2019 Associated Dental Products Ltd.